Staged reading January 2018 at Roundabout’s Underground Reading Series (NY), and will have its World Premiere in summer 2019 at The Marriott Theatre. August 2018 reading at Barrington Stage Company (MA) with planned world premiere summer 2019 at Barrington. World Premiere at Charing Cross Theatre in London, Fall 2018. Reading at Village Theatre’s Festival of New Musicals in August 2018. Developmental workshop at New York Theatre Barn in November 2017, followed by a staged reading March 2018 at Red Mountain Theatre Company’s Human Rights Festival. Commercial Producer and NAMT member Seaview Productions now has the option. US premiere in January 2018 at Horizon Theatre (GA); a staged reading March 2018 at Red Mountain Theatre Company’s Human Rights Festival, an upcoming production in 2019 at Zach Theatre and is licensed by Samuel French. Goodspeed Writers Colony (CT) in February 2018 followed by a showcase at The Other Palace in June 2018. Fall 2018 production in London, Ontario with a production at The Grand Theatre. World Premiere September 7-Oct 22, 2017 official press opening September 15, 2017), Old Globe Theatre, San Diego; announced East Coast premiere Paper Mill Playhouse, April 4 – May 5, 2019. Reading at Williamstown Theatre Festival in 2017. World premiere production at Williamstown Theatre Festival MainStage in 2018. World premiere in 2017-2018 season at Diversionary Theatre (CA). Staged reading at New York Theatre Workshop (NY) April 2017. World premiere planned for late Spring 2019 at A.R.T. in Boston, MA. World premiere in 2017-2018 season at Lyric Theatre of Oklahoma (OK). Concert presentation in NYC. Workshop production in November 2015 at San Diego State University in association with La Jolla Playhouse. New York concert presentation at Joe’s Pub October 2016, produced by Theatre C. Planned production by Theatre C (NY) in the works. Workshop at La Jolla Playhouse in 2016. Selected for the 2016 Musi-Cal showcase. Writers’ Residency at TheatreWorks of Silicon Valley. Invitation only staged reading at Village Theatre in 2016. Selected as one of the inaugural musicals in Village Theatre’s Beta Series for the 2016-2017 season with a developmental production in December 2016. Developmental Productions at Pace New Musicals and The Village Theatre in 2015. Reading at the Village Theatre Festival of New Musicals (WA) in 2016. 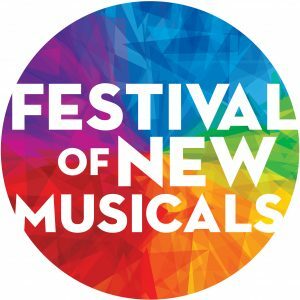 Goodspeed Musicals’ Festival of New Musicals 2015. Richard Rodgers Award 2015 and subsequent reading at Playwrights Horizons. Concert presentation at Feinstein’s/54 Below in 2016. Reading at the Village Theatre Festival of New Musicals (WA) in 2016. Selected as one of the inaugural musicals in Village Theatre’s Beta Series for the 2016-2017 season. 2018 production at Village Theatre. Kleban Prize 2019. Developmental reading at Theater Latté Da in 2015. World Premiere production at Weston Playhouse (VT) in 2014. Dance workshop in 2014 and planned production in 2015 at New York Theatre Barn. 2015 recipient of the Jonathan Larson Award. Production at Diversionary Theatre (CA) summer 2016. New York Premiere planned at Abingdon Theatre Company in spring 2017. 2019 Kleban Prize. Workshop and production at Kent State University (OH) in 2015. Reading at The Village Theatre (WA) Festival and residency at Goodspeed Musicals Johnny Mercer Writers Colony in 2014. World premiere at The Village Theatre (WA) in 2015-2016. Writers received the Fred Ebb Award for their music and lyrics. Invitation only reading at the York Theatre in summer 2016. Commercial option picked up by Playing Pretend. Production at the Fredericia Theatre in Denmark in 2015. Reading at Village Theatre (WA) Festival in 2014 and residency/retreat at The 5th Avenue (WA) in 2015. Mercer Writers Colony at Goodspeed Musicals (2013). Readings at Penn State (PA) and Amas (NY) in 2013. Production at The Spirit of Broadway Theater (2014). Production at Fredericia Theatre in Denmark (2015). World Premiere Production at Depot Theatre (NY) in Summer 2013. Concert presentation at Feinstein’s/54 Below in 2016. Industry reading in NYC in 2013. World Premiere Production at Barrington Stage Co. (MA) in Summer 2013. Reading and Off-Broadway at The Public Theater (2016). Mercer Writers Colony at Goodspeed Musicals (2013). Developmental production at The Lyric Theatre of Oklahoma City. Production at TheatreWorks Silicon Valley (CA) in 2015. Writers received 2016 Fred Ebb Award. World premiere at Lyric Theatre of Oklahoma, 2015. Commercial option (2012). Concert presentation at Feinstein’s/54 Below in 2014. Full production at Talk is Free Theatre and Show One Productions (ON) in 2011, remounted in 2012 Reading at The Human Race Theatre Company (OH) in 2012. Writing team received writing residencies at Goodspeed Musicals (CT), Trinity Repertory Company (RI) and The 5th Avenue Theatre (WA) in 2012; full production at Exit Pursued by Bear (NY) in 2013. Full production at The Spirit of Broadway Theater (CT) in 2013. Production at Aurora Theatre (GA) in 2016. Licensed by Samuel French. Reading at Goodspeed Musicals (CT) and developmental production at University of Miami (FL) in 2012. Industry reading in NYC in 2013. Full production at Cumberland County Playhouse (TN) in 2012 and Motlow College in 2014. Reading at New York Theatre Workshop (NY) in 2012 and Amas Musical Theatre (NY) in 2013. Full production at Weston Playhouse (VT) in 2012. Concert presentation at Feinstein’s/54 Below in 2014. Workshop at Trinty Repertory Theatre (RI) in 2012. Developmental production at The Village Theatre (WA) in 2013. Full production at Playhouse Square/Baldwin Wallace University (OH) in 2012 and TUTS Underground (TX) in 2013. Developmental production in 2012 and reading in 2011 at Village Theatre (WA). Concert production at Ars Nova in 2012. Studio concept album released in 2013. Production at Portland Center Stage in 2014. Production at Fredericia Theatre in Denmark and Danish cast recording, 2014. Licensed by authors with planned productions across the country. Production in San Francisco in 2015 and Los Angeles in 2016, and full production at 11th Hour Theatre (PA) and UK production in 2017. Developmental workshop at Royal & Derngate (UK) in 2011, developmental production at TheatreWorks Silicon Valley (CA) in 2012, production at Arts Garage (FL). Production at Fredericia Theater in Denmark, spring 2017. Productions at Goodspeed Musicals (CT) in 2010, Stage Door Manor (NY) in 2011, Troy University (AL) and The Human Race Theatre Co. (OH) in 2011; productions around the country. Reading at Pace New Musicals (NY), full production at Boston Conservatory (MA) in 2011. Concert productions at Ars Nova (NY) and Joe’s Pub (NY). Concert presentation at 11th Hour Theatre Company (PA) in winter 2016. Full productions at Bas Bleu Theatre Company (CO) in 2011, Signal Ensemble Theare (IL) in 2012, and Music Theatre of Madison (WI) in 2014. Full productions at Boston Conservatory (MA) and Clarke University ( IA) in 2010, Marriott Theatre Lincolnshire (IL) and Penn State NU Musical Theater Festival in 2011, and Swine Palace at Louisiana State University in 2012. Commercial option, reading at Village Theatre (WA) in 2010, full productions George Street Playhouse (NJ) in 2011 and Village Theatre (WA) in 2012. Ran over 100 performances at the Brooks Atkinson Theatre on Broadway in 2015. Licensed by MTI. Cast album released. World Premiere at Barrington Stage Company (MA) in 2010. Korean Premiere through Water Gate Media in 2010. Off Broadway at Transport Group in 2013. Cast Recording available on Yellow Sound Label in 2015. Writers received 2014 Larson Grant. Off Broadway production with Prospect Theater Company and full production at Village Theatre (WA) both in 2011. Full production at The Broadway Rose Theater Company (OR) in 2011. Workshop production at Red Mountain Theatre Company (AL) in 2010. Reading at New York Professional Theatre (NY) in 2011. Production at Fredericia Theatre in Denmark (2010); Rhinebeck Writers Retreat in 2012, Weston Playhouse (VT) retreat in 2014; workshop production at NYU-Steinhardt (NY) in 2015, reading at The 5th Avenue Theatre (WA) in August 2015, full production Asolo Rep (FL) May 2017 (co-production with 5th Avenue Theatre). Staged readings at Village Theatre (WA) in 2009 and ReVision Theatre (NJ) in 2010. Adirondack Theatre Festival (NY), Roundabout Theatre Company (NY), The Human Race Theatre Company (OH), South Coast Rep (CA), and numerous additional regional productions. Full productions in London, Sydney and Vienna.New York cast recording on Ghostlight Records. Licensed by R&H Theatricals. Workshop production at Baldwin Wallace University (OH) and at University of Michigan in 2009, and full production with Transport Group (NY) in 2010 (nominated for 6 Drama Desk Awards, won Best Book) and cast album released. Full productions at The Beck Center (OH) in 2008, ReVision Theatre (NJ) in 2011 and Boston Conservatory (MA) 2012. Production at Brigham Young University (UT) in 2010. Full production at Actors Cabaret of Eugene (OR) in 2008 and Stages Repertory (TX) in 2010. Richard Rodgers Award 2008, readings at Queens Theatre in the Park (NY) and The Public Theater (NY) in 2008, full productions at The Old Globe (CA) and ReVision Theatre (NJ) in 2009. Full productions at Goodspeed Musicals (CT) in 2008, on Broadway in 2009 and at Act II Playhouse (PA), Chicago Muse (IL) and South Korea in 2010. Nominated for 4 Drama Desk Awards. 2009 Broadway Cast Recording on PS Classics. Licensed by Music Theatre International, 212-541-4684 . Development trajectory through 3 NAMT theatres in 2008: The Human Race Theatre Company (OH), Goodspeed Musicals (CT) and Red Mountain Theatre Company (AL), full productions at TheatreWorks (CA) in 2009 and Cumberland County Playhouse (TN) in 2010. Commercial option, Full productions at the American Music Theatre Project at Northwestern University (IL) in 2008 and Pasadena Playhouse (CA) in 2011. Full productions at TheatreWorks (CA) in 2007 and 2015, Cincinnati Playhouse (OH) and The Repertory Theatre of St. Louis (MO) in 2008, and The Old Globe (CA) in 2011. Staged readings at The Araca Group (NY) and New York Stage and Film (NY) in 2007. Full production at the Edinburgh Fringe Festival (UK) in 2007. Developmental workshop with the Charlottetown Festival (Canada) and a concert presentation at Talk Is Free Theatre (Canada) in 2010. Developmental workshop with Prospect Theatre Company (NY) in 2010. World Premiere production at Stoneham Theatre (MA) in 2011. Broadwayworld Awards Boston for “Best Musical – Medium Sized Theatre” in 2012. Songs presented at Lincoln Center, Bruno Walter Auditorium in 2013. New production at Daegu International Musical Theatre Festival in South Korea. Winner of the Top Jury Honor for Best Musical Theatre Production in 2013. World Premiere at TheatreWorks (CA) in 2006, productions at Pasadena Playhouse (CA) in 2008, Off Broadway at Second Stage (NY) in 2009 and The 5th Avenue Theatre (WA)/A.C.T. in 2010. European Premiere at London’s Trafalgar Studios 2 in September 2016. Full productions at The Repertory Theatre of St. Louis (MO) in 2006, The Old Globe (CA) and Cincinnati Playhouse (OH) in 2007, Signature Theatre (DC) in 2008 and UNLV in 2015. Licensed by Theatrical Rights Worldwide. Production Off Broadway in 2006, Drama Desk Award nomination for Outstanding Lyrics in 2006, international productions include Canada, England, Germany and the Philippines. Licensed by Theatrical Rights Worldwide . Concert presentation at Texas State University (TX) in 2011.Youth theatre productions across the country. Concept Recording on Sh-K-Boom Records. Licensed by Music Theatre International . Developmental readings at the Hartt School (CT) in 2006 and Carousel Dinner Theater (OH) in 2007. Full productions at Goodspeed Musicals (CT) in 2006, Ford’s Theatre (DC) in 2007, and Porchlight Theatre (IL) in 2011. Ford’s production was nominated for 7 Helen Hayes Awards, winning 2. Studio Cast Album released in 2013 on Broadway Records starring Heidi Blickenstaff, James Moye, Bob Cuccioli and Joel Blum. Licensed by Rodgers and Hammerstein. Workshop at TheatreWorks (CA) in 2004, full productions at New York Musical Theatre Festival in 2006, Williamstown Theatre Festival (MA) in 2007 and New York University in 2010. Production at Goodspeed Musicals (CT) in 2006. Reading at The Roundabout Theatre Studios (UT) in 2009. 2005 Production at Marin Theatre Company. Winner of 2005 Bay Area Theatre Critics Circle Awards for Original Script and Original Score. 2006 NYMF production. Winner: Theatre for the American Musical (TAM) Award. Full productions at The Spirit of Broadway Theater (CT) in 2011 and the New York Musical Theatre Festival (NY) in 2006. World Premiere at Vienna Chamber Opera (Austria) in 2006. Productions at the Schomburg Center and York Theatre (NY). Readings at Amas Musical Theatre (The Snapple Th in NY) in 2011. Developmental reading at The O’Neill Theater Center (CT) in 2012. Opened on Broadway in 2006, winner of 5 Tony Awards, 7 Drama Desk Awards (including Outstanding Musical) and NY Drama Critics’ Circle Award for Best Musical. National tours in 2008 and 2009. Many professional productions worldwide. Licensed by Music Theatre International . Full productions at Goodspeed Musicals (CT) in 2005, the New York Musical Theatre Festival (NY) and 37 Arts Theatre (NY) in 2006, Bay College (MI) and Community College Theatre with 2nd Flight Productions Theater Company (VA) in 2009. Licensed by Theatrical Rights Worldwide, Robert Lindsay Nassif, 319-364-6093 . Full production in Tokyo (Japan) in 2011. Demo Tracks Available. Off Broadway production at Urban Stages (NY) in 2010. Recipient of four AUDELCO awards, including Best Choreography. Full productions at Arden Theatre (PA) in 2005 (5 Barrymore awards) and Kansas City Repertory Theatre (MO) in 2009. Full productions at the New York Musical Theatre Festival (NY) in 2004 and Spirit of Broadway Theatre (CT) in 2008. Reading at the York Theatre (NY) in 2005. Recipient of the National Music Theatre Network’s Director’s Choice Award in 2004. Full productions at the Royal Scottish Academy of Music and Drama (Scotland,) Abingdon Theatre (NY), Crossroads Musical Festival of Kansas City (MO) and The Steinhardt School at NYU (NY). Readings at The Village Theatre’s Annual Festival of New Musicals (WA), 6th Street Playhouse (CA) and Broadway Theater Institute’s Musical Monday Theater Lab (NY). Full production at Goodspeed Musicals (CT) in 2002. Full productions at the Village Theatre (WA) in 2002 and San Jose Repertory Theatre (CA) in 2005. Asian Equity Tour in 2002. Production in Taiwan with Taipei Philharmonic Foundation. 2001 Cast Recording. Workshop production at Pittsburgh CLO (PA). Productions at the Attic Theatre (CA), Theatre on the Square (IN), Theatre 98 (AL), Champaign Urbana Theater Company (IL) and Chico Cabaret (CA). Licensed by Dramatists Play Service . Geva Theatre (NY), Human Race (OH), Sacramento Theatre Company (CA), Spirit of Broadway (CT), Stages Repertory Theatre (TX), Unicorn Theatre (KS), Minneapolis Musical Theatre (MN), New Conservatory Theatre Company (CA). Licensed by Dramatists Play Service . Off Broadway production at John Houseman Theatre (NY) in 2003. Nominated for a Drama Desk Award for Best Lyrics. Amas Musical Theatre (NY), Eugene O’Neill Theater Center (CT), National Music Theatre Network (DC), Oregon Cabaret Theatre (OR), The Spirit of Broadway Theater (CT), Village Theatre (WA), New Jersey Repertory (NJ) in 2008. Full international productions at National Academy of Singing and Dramatic Art in New Zealand in 2000 and Edinburgh International Festival in Scotland in 2005. Full production in New York Musical Theatre Festival (NY) in 2004. Reading at Theater League’s Festival of New Musicals in 2007. 2000 Cast Recording. Full production at The Hartt School (CT) in 2002, and New York Musical Theatre Festival (NY) in 2006. Full production at Chicago Dramatists (IL) in 2007. In development for a potential run Off Broadway at the Transport Group. Full productions at Goodspeed Musicals (CT) and Buck Creek Players (IN) in 2001, Stoneham Theatre (MA) in 2004, American Stage Company (FL), Theatre on the Square (IN). Productions in Johannesburg (South Africa), and Crossroads Theatre Company (NJ) in 2003. Over 30 regional productions, including the John Houseman Theater (NY), American Musical Theatre of San Jose (CA), Chanhassen Dinner Theatre (MN), Actors’ Playhouse (NY), Act II Playhouse (PA. Licensed by Mitch Douglas at ICM, 212-556-5600 (phone), 212-556-5665 (fax). Published by Samuel French, Inc. .
Full productions at the Denver Center for Performing Arts (CO) and the Cleveland Playhouse (OH). Full production at the Old Globe Theatre (CA) in 2001. Reading at the Asia Society (NY) in 2010. Recipient of the Richard Rogers Development Award for Musical Theatre in 2001. 2008 Cast Recording on DINK Records. Over 4,000 productions in US and Canada, winner of the Olivier Award. In 2003, Honk Junior was created and has had hundreds of productions in the US and Canada. Studio Recording on First Night Records, Music Theatre of Witchita recording. Licensed by Music Theatre International. Reading at CAMI Recital Hall (NY) in 2001. Full production at San Diego Repertory Theatre (CA) in 2008. Workshop production at Ravinia Festival (IL) in 2006. Staged reading at American Place Theatre (NY) in 2000. Winner of the Richard Rodgers Award, the Jonathan Larson Performing Arts Foundation Award, the Edgarton Award. Nominated for two NAACP Theatre Awards. Off Broadway at Variety Arts Theater, York Theater Company (NY). Many regional productions. York Concert Recording on Jay Records. Nominated for a 2001 Outer Critics’ Circle Award for Best Off Broadway Musical.Licensed by Dramatists Play Service . Playwrights Horizons (NY), numerous regional productions. Studio Recording on Ghostlight Records. 2001 Drama Desk and Lucille Lortel nominations for Best Musical. Licensed by Dramatists Play Service . Over 50 full productions, including Dallas Lyric Stage (TX), Paper Mill Playhouse (NJ), Perseverance Theatre (AK). Winner, Frederick Loewe Award. Televised broadcast as part ofGreat Performances’ 30th Anniversary Season in 2002. Cast Recording on KIC Music. Workshop production at John Jay Theatre (NY) in 1999. Over 1,600 productions around the US. Paper Mill Playhouse Cast Recording on RCA Victor. West End revival 2012. Licensed by Music Theatre International, 212-541-4684 . Full productions at Papermill Playhouse (NJ) In 1998, Santa Barbara Civic Light Opera (CA) In 2000 and Penobscot Theatre (ME) in 2010. Full production at Penn State (PA). Full productions at Ford’s Theatre (DC) in 1998, and Piedmont Players Theatre (NC) in 2009.Licensed by Samuel French. Ford’s Theatre Cast recording on Bypass in 1998. Full productions at Goodspeed Opera House (CT) in 1998, York Theatre (NY) in 2005, and Princeton Festival (NJ) in 2008. Licensed by Music Theatre International, 212-541-4684 . Full production at Tennessee Repertory Theatre (TN) in 1996. Broadway, National Tour, numerous regional productions. Original Broadway cast recording on RCA Victor. Six 2002 Tony Awards, including Best Musical. Over 1,700 productions. Licensed by Music Theatre International. American Premiere at New Jersey Shakespeare Festival (NJ) in 1999. Most-produced new musical of the 2000-2001 season in American regional theater. Full productions at The Globe Theater (CA), Oregon Shakespeare Festival (OR), San Jose Repertory (CA), Laguna Playhouse (CA), Indiana Repertory Theatre (IN), The Shakespeare Theatre of NJ (NJ), as well as internationally in Switzerland, and Northlight Theater (UK). Nominated for an Olivier Award for Best New Musical. Licensed by Theatrical Rights Worldwide . Full productions in Los Angeles (CA), Indianapolis (IN), and Dallas (TX). In concert (NY) with Kris Kristofferson. Full production at George Street Playhouse (NJ), York Theatre (NY), and several regional productions. Licensed by Theatrical Rights Worldwide . Full productions at Paper Mill Playhouse (NJ) in 1993, Walnut Street (PA in 1996), Goodspeed Musicals (CT), 1996, Ford’s Theatre (DC) in 1997, and Stage One (KS). International production at the Bunkamura Theatre (Tokyo) in 1998, and a tour in Japan through 1999. Reading at the Eugene O’Neill Theatre Center (CT in 1996), full production at Old Globe Theatre (CA) in 1998. Full productions at Dallas Lyric Stage (TX) in 2001, Goodspeed Musicals (CT) and North Shore Music Theatre (MA) in 2005, Arena Stage (DC), Cleveland Playhouse (OH), Helen Hayes Performing Arts Center (NY), Shubert Theatre (MA), African Globe TheatreWorks (NJ). Hackney Empire (London) in 2013. Off Broadway production at York Theater Company (NY) in 1999. Full productions at Apple Tree Theatre (IL), Broadhollow Theatre (NY), King’s Head Theatre Club (UK), Lyric Stage (MA), Village Theatre (WA). Outer Critic’s Circle Nomination-Best Musical (NY). Winner of 5 Dalas Theatre League Awards. Off Broadway cast recording on Varese Sarabande. Full productions at Goodspeed Opera House (CT) in 1995, Sacramento Music Circus (CA) in 1996, American Stage Company (NJ) in 1997 and York Theatre (NY) in 2006. Licensed by Samuel French . Off Broadway production at the John Houseman Theatre (NY) in 1995. Licensed by Samuel French – London. More than 90 productions in the United States including Marriott Theatre (IL) and Derby Dinner Playhouse (IN), produced internationally in Australia, Canada, England, Kuwait and Russia.Licensed by Music Theatre International, 212-541-4684 . American Premiere at UTEP Dinner Theatre (TX) in 1996. Cast recording on SBME Import. Full production at Civic Light Opera of South Bay Cities (CA) in 1995. Licensed by Music Theatre International, 212-541-4684 . Production at the National Black Theatre (NY) in 2011. Full production at Ford’s Theatre (DC) in 1995. Produced at the Sverdlovsk State Academic Musical Comedy Theater in Russia in 1993, ran for 4 years. Cleveland Playhouse (OH), Goodspeed Musicals (CT), Marriott Theatre (IL), Pasadena Playhouse (CA), Sacramento Light Opera Association (CA), Theater League (KS), Village Theatre (WA), Adirondack Theatre Festival (NY), Morris Mechanic Theatre (MD) from 1993-1995.1994 Pasadena Playhouse Cast Recording on Varese Sarabande. Licensed by Rodgers and Hammerstein Theatrical Library. Reading at the York Theatre (NY) in 2001. Full production at Stamford Theatre Works (CT) in 1996. Full production at Ford’s Theatre (DC) in 1992. Readings at the York Theatre in 2016 and 2017. Full production at Steel Beam Theatre (IL) in 2009. Amas Musical Theatre (NY), over 120 productions around the country, and international productions in Canada and Japan.Cast Recording on Lml Records. Published by Samuel French . Full production at La Mirada Theatre (LA) in 1992. Full production at Amas Musical Theatre (NY) in 1992. Players Theatre (NY), over 200 productions around the country. Los Angeles Recording on Varese Sarabande. Licensed by Samuel French . Revue by Musical Theater Works (NY) in 1990. Full production at Maine State Musical Theatre (ME) in 1991. Readings at the Blue Heron Theater (NY) and the Signature Theatre (DC). World Premiere at Goodspeed Musicals (CT) in 1990. Full production at Amas Musical Theatre (NY) in 1990. Reading at Starlight Musical Theatre (CA) in 1990. Off-Off Broadway production at Amas Musical Theatre (NY), Off-Broadway Test Run at Hudson Guild Theatre (NY) in 2001. Off Broadway production at the John Houseman Theatre (NY) in 2002. Off Broadway recording on Eric Krebs Productions. Licensed by Samuel French . Off Broadway production at Promenade Theatre (NY) in 1990. Original cast recording on Painted Smiles. Full production at Goodspeed Musicals (CT) in 1989. Presented as part of a two-act opera entitled Love In Two Countries at St. Peter’s Church (NY) in 1991.